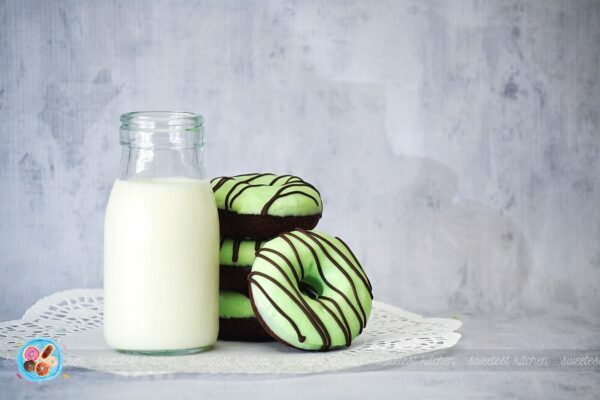 These fudgy mint chocolate baked donuts have a subtle hint of mint in the white chocolate icing and are so easy to create! 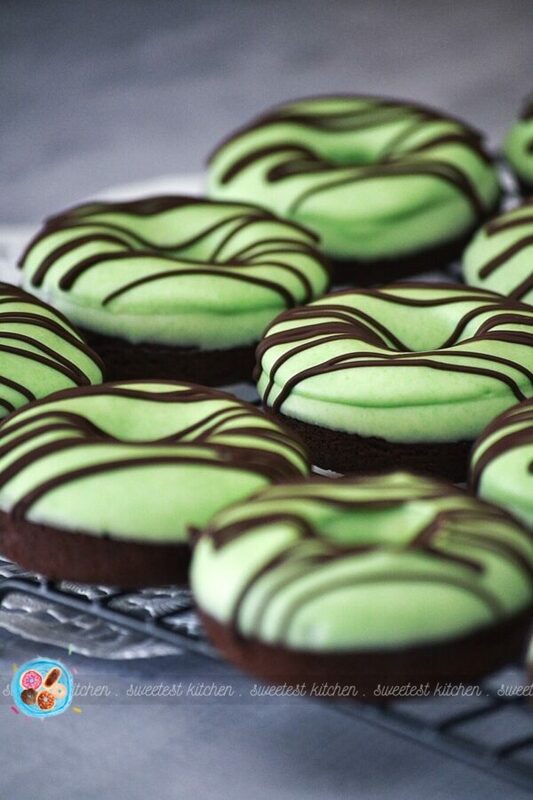 Mint and chocolate were “mint” to be together in these fudgy mint chocolate baked donuts! Do you love mint chocolate (I know you do, otherwise you wouldn’t be reading this right now!)? 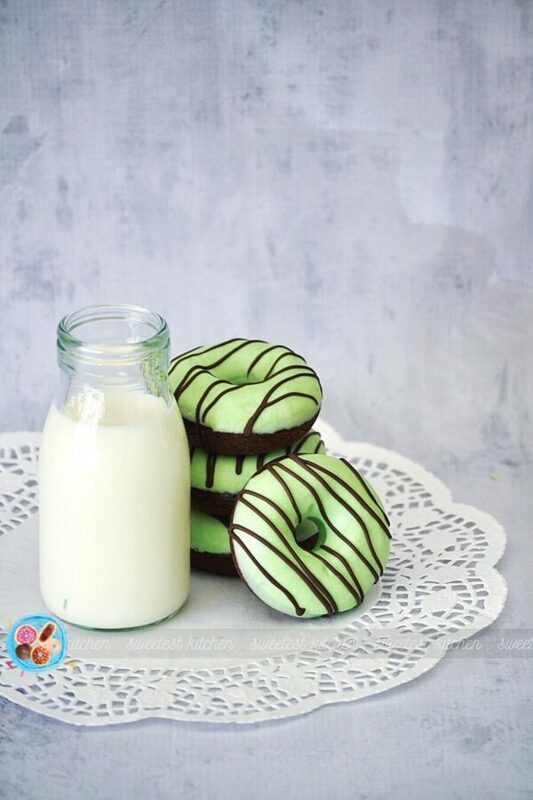 If so, you’ll have to make these pretty pastel green donuts! If I seem super excited, it’s because I actually am super excited – I made these donuts on a whim the other day while one of my children was home sick from school. Being stuck at home with him for the day meant I could either finally catch up on some housework, or bake something. Obviously, I chose the latter option! I didn’t really have a full plan for these donuts; I was just winging it. I only knew I was after chocolate donuts. After browsing through my collection of flavorings, I decided on a mint white chocolate icing. But when I finished dunking the donuts in the icing (I double-dipped them, by the way! ), I thought they looked kind of plain. A-ha, I thought, a dark chocolate drizzle! I was very happy with how they turned out, which is why I’m so excited to share the recipe with you today! These donuts are baked in a donut baking pan, so they are totally cake-like. The batter doesn’t need any sort of electric mixer or any odd ingredients, so it’s really easy to whip up. You’ll notice the batter will be really thick and I highly recommended using a piping bag to pipe the batter into the donut pan (I promise doing it this way will make it much easier than spooning the batter into the pan!). You can use a regular-sized donut baking pan, or a mini-sized one, for this recipe. I used the mini-sized, which gave me 22 mini donuts. Whichever pan you use, the most important thing to remember is not to overbake the donuts. With the mini-sized pan, I only needed to bake the donuts for 7 minutes at 350F. For regular-sized, I’d recommended to start checking for doneness at 10 minutes, but they make take up to 13 minutes to bake. For the icing, I simply melted about 200g of white chocolate (real white chocolate, not the fake stuff) and added peppermint extract plus some green food coloring. I was stuck using liquid food coloring, which didn’t mix in perfectly (the end result was a little speckly), as I was out of the coloring gel. I’d highly recommend using the gel, or powder, to get better results. 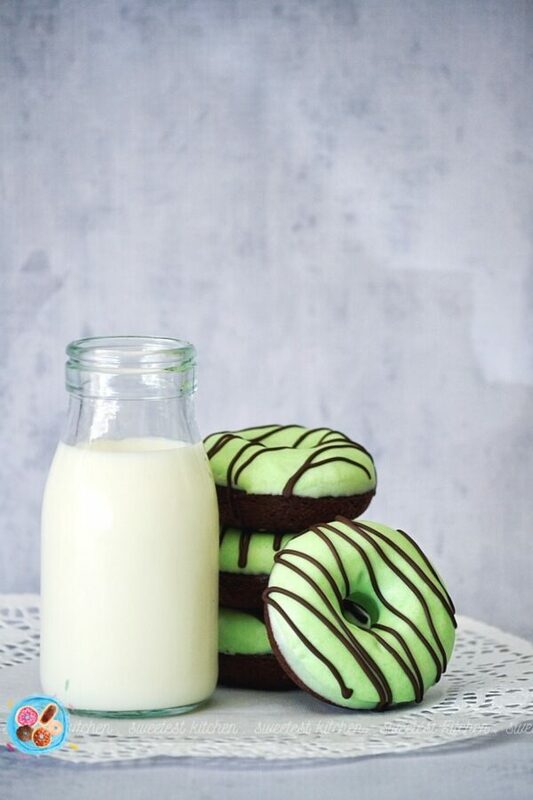 With 200g of white chocolate, you should have plenty leftover for a double dip, so after the first dip, let the chocolate fully set on the donuts, then go back and double dip them all! Let the second layer fully set before adding the dark chocolate drizzle. The zig-zag dark chocolate drizzle is just melted dark chocolate. Easy! You can either use a spoon to drizzle the chocolate on, or a piping bag (I used a Ziploc bag!). If you can wait, let the chocolate drizzle set, then ENJOY IMMEDIATELY!!!! Pro tip – this weekend is Mother’s Day! 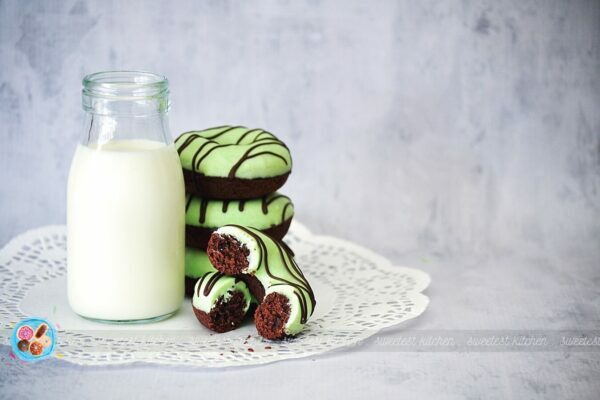 If your mum loves mint + chocolate, you’ve got to make these for her!! And include a homemade card that has a funny minty pun, like, “I ‘mint’ it when I said ‘I love you‘!”! Preheat the oven to 350F (180C). Lightly grease the wells of two donut baking pans (you can use either mini-sized (yield 22 donuts) or regular-sized (yield 12 donuts) and set aside. In a large mixing bowl, whisk together the cocoa powder, flour, brown sugar, baking powder, baking soda, espresso powder and salt. In a medium-sized mixing bowl, whisk together the eggs, milk, vanilla, and vinegar. You may notice some curdling of the milk, which is fine. Add the wet ingredients, along with the melted butter or oil, to the dry ingredients. Stir gently with a wooden spoon until no floury bits remain; take care not to overmix or your donuts may end up a little tough. Transfer batter to a piping bag and pipe the batter into the wells of the prepared donut baking pans. Fill them about ¾ full. If you're using two mini donut pans, you'll have to bake in two batches. Bake mini-sized donuts for 7-9 minutes; bake regular-sized donuts 10-13 minutes. You can do the toothpick test to check if the donuts are done, or simply lightly press on top of the donuts - if they spring back, they are done. Whatever you do, do not overbake!! Remove the doughnuts from the oven, and after 30 seconds or so, loosen their edges (if needed), turn the pan upside down over a rack, and gently let the doughnuts fall onto the rack. Let the donuts cool completely before dipping into the icing. For the mint icing: Melt the white chocolate using your preferred method. Add ½ teaspoon peppermint extract, or a little more, to suit your tastes, and a couple drops of green food coloring - you'll be after a pastel-like mint green color, so add a little bit at a time, and stir after each addition, until you reach your desired color. Carefully dip the cooled donuts into the melted chocolate (if you find the chocolate is a little runny and drips all over the sides of the donuts, set the chocolate aside for a little bit to thicken up). Let the chocolate icing set. You should have plenty of chocolate left to double dip the donuts, so go for a second layer and let it set before adding the dark chocolate drizzle. For the dark chocolate drizzle, melt the dark chocolate using your preferred method. 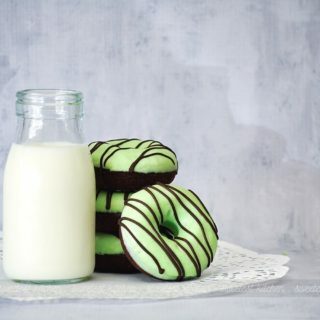 Transfer the melted chocolate to a piping bag and cut a small opening in the bottom then drizzle the chocolate over the donuts in a zig-zag motion (you can also just use a spoon to drizzle the chocolate). Let the donuts set once more (if you can wait), then ENJOY IMMEDIATELY!! Can be stored in the refrigerator, or at room temperature; best eaten within two days. Can I use enriched flour? And espresso powder … can I just grind my own beans for that? Thanks, can’t wait to make these!